The harmful algal blooms that manifest on Lake Erie in the summer can be as murky a concept to understand as they look. But it’s important to recognize the distinct and sometimes dangerous impact these blooms can have beyond the Great Lakes’ banks: Harmful algal blooms are capable of producing toxins that can cause skin rashes, GI problems and varying degrees of damage to a person’s liver, kidneys and nervous system. Perhaps the most infamous instance of the excessive growth of microscopic algae organisms, commonly known as blooms, resulted in a three-day shutdown of the city of Toledo’s water supply in 2014. We asked Ohio State’s own bloom experts — Ohio Sea Grant Director Christopher Winslow and Jay Martin, professor in the Department of Food, Agricultural and Biological Engineering and also with Ohio Sea Grant — about the perennial problem of blooms, their hazards and what’s being done about them. 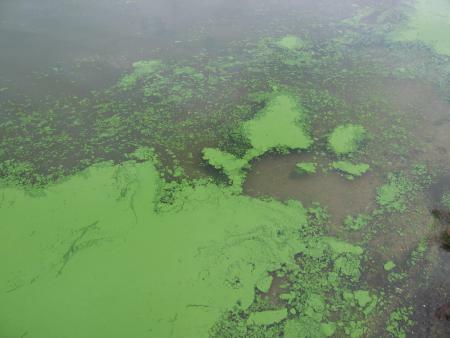 Harmful algal blooms are caused by increases of phosphorus in the lake. While septic tanks, lawns, golf courses and wastewater treatment plants also contribute phosphorous to runoff that ends up in Lake Erie, about 85 percent of the phosphorus comes from agriculture. Heavy spring rains lead to greater runoff of phosphorus from farm fields. The Maumee River runs through extensively farmed agriculture land as it winds through eastern Indiana and western Ohio and then feeds into Lake Erie near Toledo. Bloom events are likely to be at their greatest in August and September and are usually finished by mid-October. On a scale of 1 to 10, scientists predict this year’s bloom to be a 6. That’s smaller than 2017's prediction of 7.5 and the record-setting years of 2015 and 2011. Just where a bloom settles or shifts to is determined by the winds. Additionally, if surface water is calm, the bloom may lie beneath the surface; heavy storms can mix up the water and the algae along with it. Communities from Sandusky, Ohio, and westward are at a higher risk because of the more shallow water in that part of the lake. Human and animal health are threatened. Harmful algal blooms are a known liver toxin and can negatively affect the nervous system. Skin irritations are also a concern. County health departments post advisories regarding when it is unsafe to be in or on the lake or to eat non-commercially caught fish from the lake. The same health concerns exist for pets, which can’t control their water intake as well as people. It doesn’t take an economist to know that slime of any color keeps people away from the lake. Ohio State researchers estimated blooms at two Ohio lakes cost homeowners $152 million in lost property value over six years. And a study commissioned by the International Joint Commission estimated that harmful algal blooms in Lake Erie in 2014 resulted in $43 million in lost tourism and recreation dollars. Communities along the lake are spending millions more for water treatment, as well. Scientists are tracking the blooms and working with agriculture experts to address causes. The key is to reduce the amount of phosphorus that gets into the lake. Ohio law now prohibits farmers from spreading fertilizer on frozen ground, and Ohio State researchers are encouraging farmers to insert fertilizer into their fields rather than spread it across the surface. The result is less phosphorus in the runoff. Already since 2014, the amount of farmland being treated with subsurface placement of fertilizer has increased from 33 to 39 percent. Additionally, the percentage of acres planted with cover crops when the fields would otherwise be empty has increased from 17 to 27 percent. Farmers also are being encouraged to plant buffer strips to further deter runoff. Ohio, Michigan and Ontario have adopted a goal to reduce the amount of phosphorus entering Lake Erie by 40 percent by 2025. These measures are not without cost. Ohio Sea Grant is coordinating $6.8 million in research funding from the Ohio Department of Higher Education, The Ohio State University’s College of Food, Agricultural and Environmental Sciences and the National Oceanic and Atmospheric Administration to work with farmers, track blooms, help water treatment facilities remove toxins from drinking water and continue researching their effects on humans.